Do you Love camping at Salmen Scout Reservation? Want to give something back to camp? The Southeast Louisiana Council is looking for dedicated scouters to join the Campmaster Corps. Campmasters serve as good stewards and liaisons to scout units visiting Camp V-Bar on weekends. Campmasters serve as frequently as they wish, but we hope you'll love it and want to do at least 2 weekends a year. Campmasters work from 5pm on Friday until the last unit leaves. Make it a family affair, your family is welcome to join you! Campmasters (and their families) stay in a cabin eliminating the need to pitch tents. 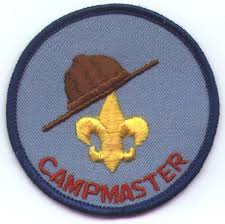 If you are interested in serving in the Campmaster Corps, contact Christopher Blohm at vbarcampmaster@gmail.com. Seeking: Dedicated Scouters, bring your family, they are welcome!